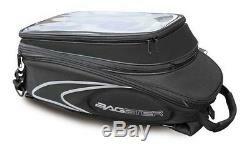 Bagster Evo Sign Motorcycle Motorbike Touring Luggage Tank Bag - 20-30 Litre. Bagster Evo Sign Tank Bag - 20-30 Litre. The EVOSIGN bag is very sober and is focusing on extra comfort thanks to the two back pack straps and on security with auto reflecting inserts. The compartment under the map holder is practical on the bike and as a back pack. The flexible volume remains practical in all circumstances. Chamfered front particularly suitable for sport bikes. W 36cm, L 44cm, H 17cm - 20/30 litre. How is my item sent? Any small, low cost items and weighing less than 1000g will be sent to you via 3 day courier unless a quicker service is cheaper to use. Larger/heavier and more valuable items will be delivered by our courier. If you notice any damage on the package or if you think it has been mishandled always sign as damaged. How long will it take to receive my order? Dispatch times are shown in the listing. However any goods ordered after 3pm on Fridays or over the weekend will not be dispatched until Monday. Courier international approx timescales: 2-4 Days 3-5 Days Austria Czech Republic Belgium Estonia Denmark Finland Germany Hungary France Italy Luxembourg Poland Netherlands Portugal Northern Ireland Slovakia Eire Slovenia Spain Sweden. PLEASE NOTE THAT THE NEXT DAY COURIER SERVICE IS ONLY AVAILABLE FOR UK MAINLAND (excludes Scottish highlands / N Ireland). ALSO NOTE THAT INTERNATIONAL DELIVERYS ARE ONLY AVAILABLE TO MAINLAND DESTINATIONS. If for any reason you would like your items to be delivered later than the advertised timescales we will make every effort to help. How can I track my order? If you have provided us with a mobile telephone number you will also receive an SMS text informing you on when your items are likely to be delivered. At present order tracking is only available for items that have been sent to you via our courier service. What happens if Im out when you deliver? Please do not place tape directly onto the box as this means the box can not be used and we reserve the right to charge to replace it. Stockton on Tees, TS16 0QS UK. Address: MSG Bike Gear Newsham Hall Aislaby Eaglescliffe Stockton on Tees TS16 0QS. Tech 7 Expanding Semi-Rigid Motorcycle Saddlebags Luggage Panniers + Rain Cover. Givi Z126 Rubber Bungs For Monolock / Monokey Base Plates & Wingracks x 4. Givi Motorcycle Easy Range Motorbike Leg Walllet Poouch EA109B (TS54B). ROXTER VENTILATED MOTORCYCLE MOTORBIKE HIKING SKIING RIDING SOCKS - 2 PAIR 8-13. Givi Z140R Replacement Top Box/Case Lock & Keys Set - E470/21/300/260/B47 +More. Oxford Clean Grips Motorcycle Handlebar Grip Covers OF778 New. MSG Bike Gear Newsham Hall Aislaby Eaglescliffe Stockton on Tees TS16 0QS. The item "Bagster Evo Sign Motorcycle Motorbike Touring Luggage Tank Bag 20-30 Litre" is in sale since Thursday, March 15, 2018. This item is in the category "Vehicle Parts & Accessories\Motorcycle Accessories\Luggage\Other Luggage". The seller is "msgbikegear_ltd" and is located in GB. This item can be shipped worldwide.